Did the earthquake really happen? Did the tsunamis hit yet and were they big enough for damage? The January 23, 2018 M 7.9 earthquake southeast of Kodiak Island in the Gulf of Alaska occurred as the result of strike slip faulting within the shallow lithosphere of the Pacific plate. Focal mechanism solutions indicate faulting occurred on a steeply dipping fault striking either west-southwest (left lateral) or north-northwest (right lateral). 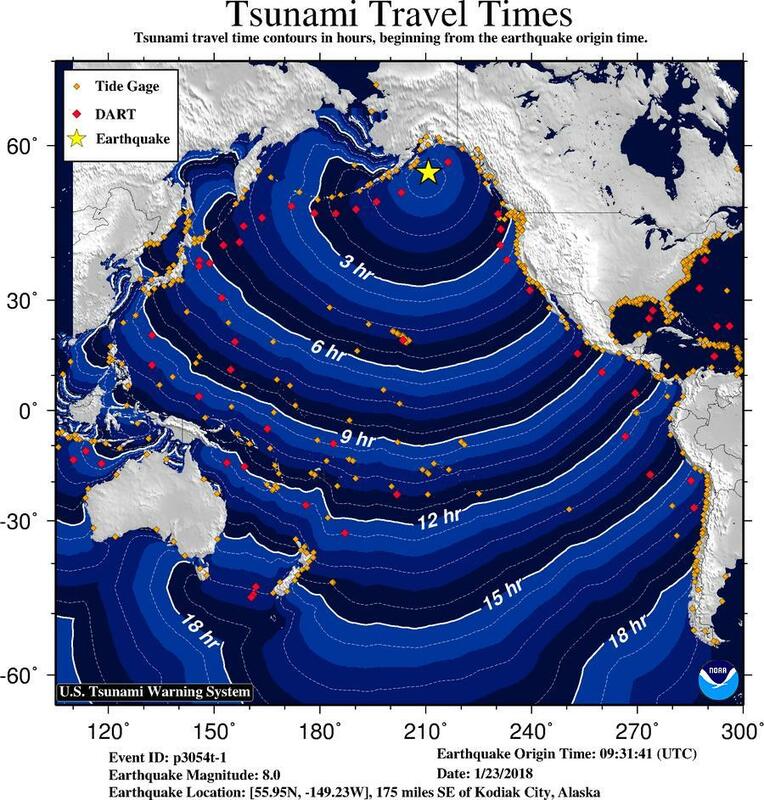 At the location of the earthquake, the Pacific plate is converging with the North America plate at a rate of approximately 59 mm/yr towards the north-northwest. The Pacific plate subducts beneath the North America plate at the Alaska-Aleutians Trench, about 90 km to the northwest of todayâ€™s earthquake. The location and mechanism of the January 23rd earthquake are consistent with it occurring on a fault system within the Pacific plate before it subducts, rather than on the plate boundary between the Pacific and North America plates further to the northwest. While commonly plotted as points on maps, earthquakes of this size are more appropriately described as slip over a larger fault area. Strike-slip-faulting events of the size of the January 23, 2018 earthquake are typically about 230x30 km (length x width). Large earthquakes are common in the Pacific-North America plate boundary region south of Alaska. Over the preceding century, 11 other M7+ earthquakes have occurred within 600 km of the January 23, 2018 earthquake. Most of these have occurred on the subduction zone interface between the two plates, to the north and northwest of todayâ€™s earthquake, including the M 9.2 Great Alaska earthquake of March 1964. The hypocenter of the 1964 event was located about 550 km to the north of the January 23rd earthquake, and the rupture of that event broke much of the shallow subduction zone interface over several hundreds of kilometers. To the southeast of the Alaska Trench, two large (M 7.9 and M 7. strike slip earthquakes occurred in November 1987 and March 1988, respectively, several hundreds of kilometers to the east of the January 23, 2018 earthquake. These two earthquakes are not known to have caused any casualties or damage. Link for tsunami advisory. There are none at this time.